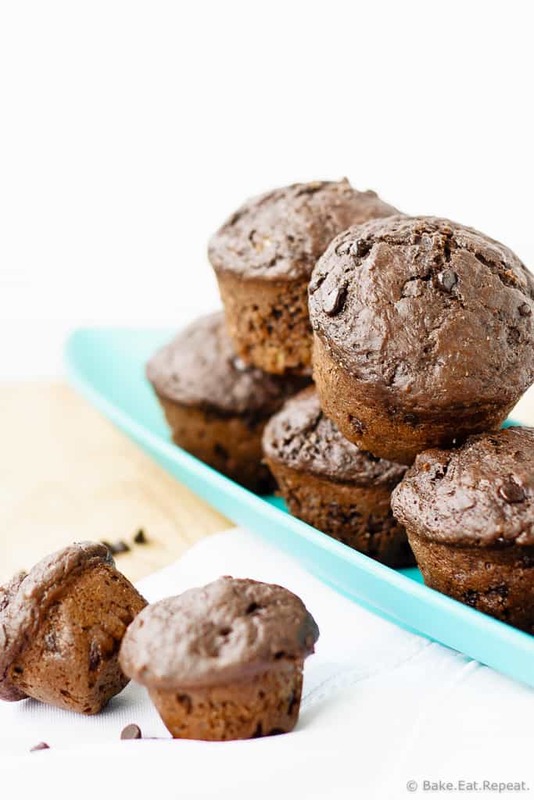 These healthy double chocolate cherry muffins are fast and easy to make, taste great, and are healthy enough for breakfast! I have been dreaming of a healthy chocolate muffin for ages. Actually, to be exact, a healthy chocolate cherry muffin. The double chocolate part that was attained by adding a few mini chocolate chips wasn’t a necessity, I admit. But more chocolate? It was really a no brainer. Obviously more chocolate is always better. Not healthier I suppose, but you can’t have everything! Except with these muffins. Because they really ARE healthy. And tasty. And chocolatey. So I’m happy. Originally I was actually envisioning a healthy black forest cake style muffin, and I still really want to make that happen, but these aren’t really it. I used dried cherries for the cherry part, instead of the pie filling type cherries that are more reminiscent of black forest cake. So, not black forest cake, although I am definitely still planning on making that a thing. But let’s be honest, you add cherry pie filling to a muffin and it’s no longer a healthy muffin, but more of a black forest cupcake. Dried cherries are just healthier. And easier. 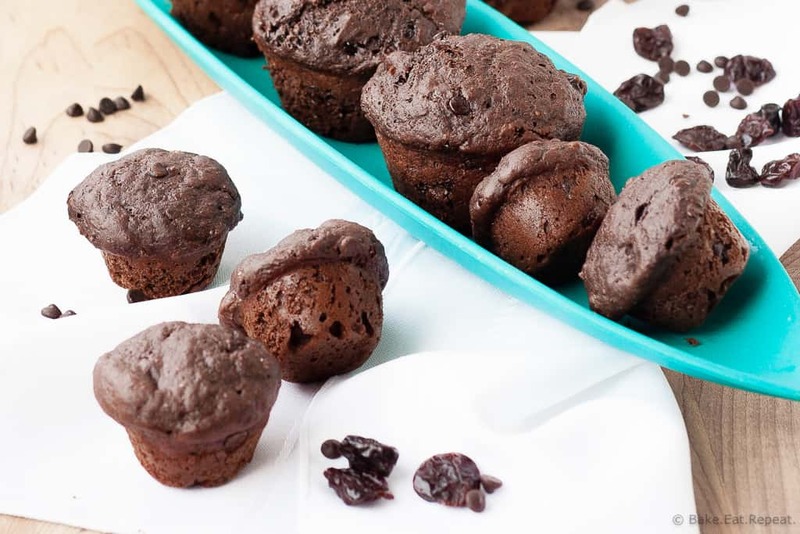 These chocolate cherry muffins come together and are in the oven in under 15 minutes. My oven was barely preheated by the time they were ready to go in. You can’t beat that. It’s one of the reasons I love making muffins so much. So fast and easy, and so many options. Plus you can make them as healthy or as decadent as you like. We all know I lean toward making them as healthy as possible, but I figure if I’m making muffins, I want to be able to eat them for breakfast. And snacks. And pretty much whenever I get the hankering for a muffin. And I want to do that guilt free! 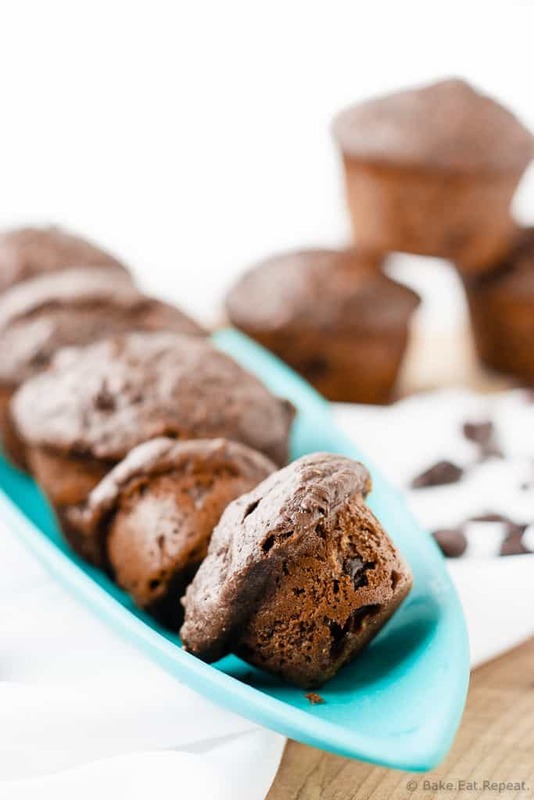 These healthy double chocolate cherry muffins are the perfect grab and go breakfast, or a great snack to toss in your kids lunchbox. They’re quite healthy, using whole wheat flour, only 1/4 cup of brown sugar and 1/4 cup of oil for the entire batch, and unsweetened cocoa powder provides the chocolatey taste. There IS a little more sugar in the mini chocolate chips and dried cherries, I admit, but there’s only a quarter cup of each, just enough for a taste without overloading the muffins. I’ve also shared this Healthy Double Chocolate Cherry Muffin Recipe over on Food Fanatic. These look and sound DELICIOUS! I can always get on board with chocolate for breakfast! Yeah, me too. No issues here with having chocolate for breakfast! :) Thanks Andi! Double chocolate for breakfast? Sign me up! Love that they're healthy too! The dried cherries sound perfect in here! Man oh man I wish I had some of these babies right now. They look, sound and I bet taste delicious! Can't wait to try them Stacey! Pinned!! Thanks Cyndi! Hope you enjoy them! Thanks for pinning! Mmmm! And yes to double the chocolate! And for breakfast? yes please! Chocolate for breakfast is always a good idea right?! Thanks Meg! Healthy and loaded with chocolate! Yes please. I need these for breakfast asap! Hahaha, that's always when I want a snack - exactly when I'm telling my kids it's almost supper and they can't have one! :) Thanks Ashley! I'm wishing I had one of these for breakfast! Love chocolate and cherries together. Chocolate and cherry sound like a perfect breakfast. Glad you created this recipe! Oh how I'd love to have these on my breakfast table in the AM! These look so good and I love the cherries in them! I need to add this recipe to my muffin collection! I always forget that I own the 500 muffins book.. I should pull it out! 500 muffins book? Why have I never heard of that?! Clearly I need to go find it! We eat a lot of muffins at our house. We will have to try these! I love a quick and easy muffin recipe! I actually would prefer the dried cherries to the pie filling, so this is perfect! Yeah, me too, I'm not actually a big fan of the pie filling. So I DID enjoy these, they just weren't really the black forest cake that I started off to make! Thanks Courtney! I can never get enough chocolate muffins. Love that you put cherry inside! Yes! Double the chocolate and healthy? I want these NOW!! Right?! Can't beat that combo! :) Thanks Manali! Healthy muffins are my absolute favorite thing to bake. They are so easy and make great snacks! These look perfect with the chocolate and cherries! My absolute favourite thing to bake too Kristine - so many combos, so fast, and such great snacks! Thanks! Chocolate for breakfast sounds good to me. :) These muffins sound amazing! Fantastic pics, Stacey! These look so happy. And I'm glad you were able to find a healthy fix for your cherry chocolate craving! It's always nice when you can manage to curb a chocolate craving with something healthy - that doesn't always work! Thanks Mir! You had me at double chocolate, Stacey! These look incredible! I love finding new healthy muffin recipes, especially ones that involve chocolate. And I'm loving the cherry flavor, too! I think this would make the perfect breakfast or snack! Thanks Gayle! The words double chocolate always convince me I need it! :) Especially when combined with healthy!